Homemade marshmallows are one of those really intimidating recipes that are actually really easy to make. 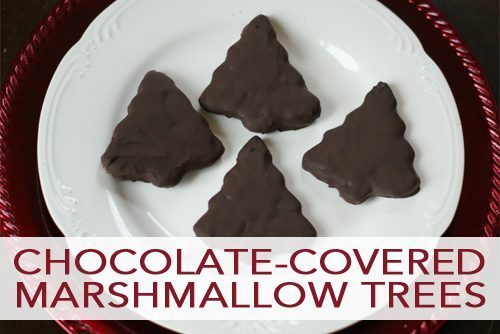 This year I decided to try to make one of our favorite Christmas treats — chocolate covered marshmallow shapes — and although there are a few steps involved, these are really easy to make too! For even fancier treats, you could add candy ornaments or sprinkles as well. As for these, we taste tested a few, but I’ve packed the rest up in treat bags for our advent gift to the girls next Sunday! Line a rimmed baking sheet or bar pan with parchment paper or plastic wrap. Spray with cooking spray and set aside. Add 1/3 cup cold water to your electric mixer bowl and sprinkle with gelatin. Let sit for 5-10 minutes. In the meantime, bring 1/3 cup water, sugar, corn syrup and salt to a boil until it reaches 238° on a candy thermometer (about 5 minutes). Whisk gelatin mixture on low speed, slowly adding the syrup by pouring it down the side of the bowl. Gradually increase to high speed and beat for about 12 minutes until thick and white. Add vanilla and beat for 30 seconds. Pour the marshmallow mixture onto baking sheet and smooth with a spatula or another piece of parchment sprayed with cooking spray until it’s 1/4″-1/2″ thick. Let sit, uncovered, for at least 3 hours. Spray cookie cutter or knife with cooking spray to prevent sticking and divide into individual marshmallows. Turn over and let them cure for 8 hours or overnight. The next day, melt chocolate chips in a double boiler (I used about 2 tablespoons per marshmallow). Remove from heat and stir until smooth. Carefully set one of the marshmallows in the melted chocolate, using a spoon to cover it with chocolate. Use the spoon to lift the marshmallow from the bowl. Set it on parchment paper. Smooth out any bumps with the back of the spoon. Use a knife to carefully move any excess chocolate away from the edges. Repeat with remaining marshmallows. Let sit for 3-4 hours until the chocolate is hard. Store in individual treat bags or a tightly sealed container with parchment or wax paper between the layers. Click here to add this recipe to your Plan to Eat account.